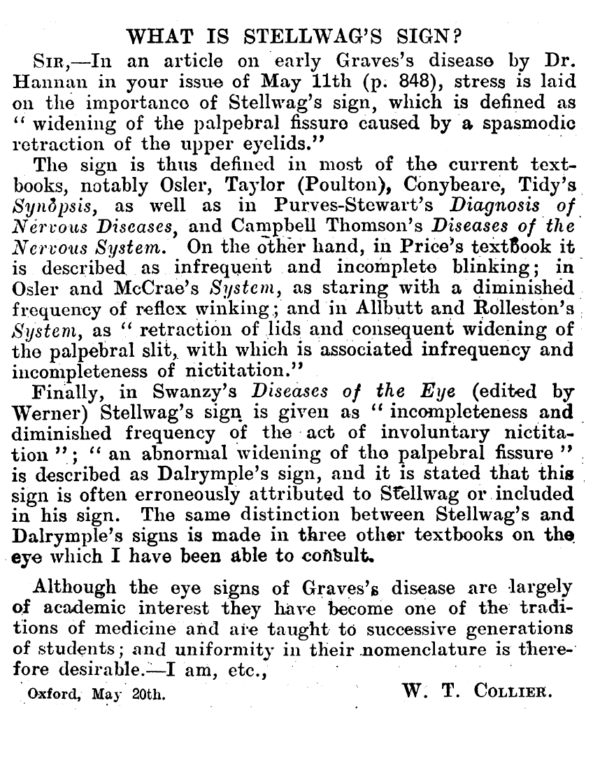 1852 – John Dalrymple (1803–1852).a widened lid opening in exophthalmus with scleral show above the upper margin of the cornea leads to what is more commonly referred to as lid retraction. The palpebral fissure was open very widely, so that thin slivers of sclera remained visible directly above and below the cornea, when the patient looked straight ahead, even under very bright conditions. Blinking became less frequent and incomplete. At various times over many days, I witnessed how both eyelids would not move for several minutes. At other times, only a marginal twitching of the eyelids was visible over several minutes. In no way was a full closure of the eyelids observed over this period of time. The immobility of the lids came to become ‘normal’ during quiet, undisturbed conditions or when the patient was staring / fixating on something….Within a short period of time of becoming agitated or excited, the patient’s blinking would increase in frequency, yet the closure remained incomplete. Voluntary blinking however remained unaffected. Upon asking the patient to blink, they would do so lightly and with normal power. However, I discovered that the voluntary movement was followed by several involuntary complete blinks in rapid succession. Gradually, the blinking became less frequent and incomplete as to stop altogether.‘ Stellwag 1869;25:40. In Europe, the triad of hyperthyroidism, goiter, and exophthalmos is often referred to as Basedow disease. In England and the United States, the preference is to call the condition Graves disease. Multiple alternate definitions of Stellwag sign exist. Stellwag von Carion K. Uber gewisse Innervationsstörungen bei der Basedow’schen Krankheit. Wien Medizinische Jahrbücher. 1869;25:25-54.